More international yacht sale with a 85' Princess in Mallorca! : Atlantic Yacht & Ship, Inc.
Joe Marino and Brent DeSellier of our Fort Lauderdale office report another international yacht sale with an 85′ Princess in Mallorca! Known as the V85 model, this Princess yacht is one of the most exciting and innovative new models in the history of Princess Yachts. With breathtaking good looks, dynamic handling and thoroughbred performance she leaves no doubt that she represents the ultimate in V-class technology. Yet the broad beam, huge volume and ground-breaking design provide a level of luxury and flexibility previously unknown in this market. The efficient, modified deep V-hull allows searing performance but incorporates the handling advantages of conventional drive with a consistent, stable ride throughout the speed range and precise maneuverability at close quarters. 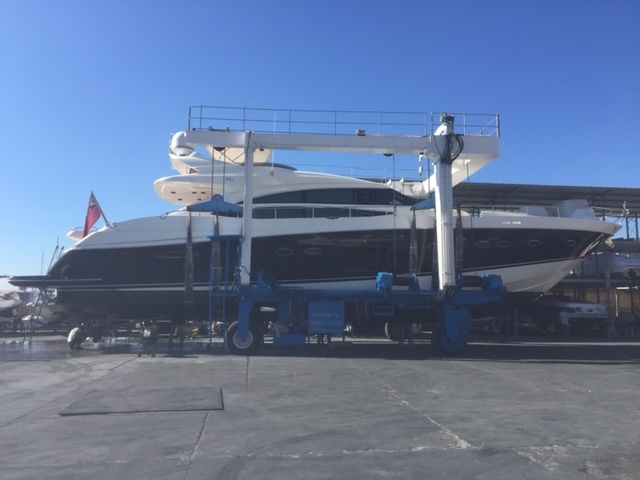 Along with great handling this yacht features some cool aspects such as the retractable sun roof, hydraulic tender platform, tender garage, and much more. For more information on how we can help you complete your international yacht sale, including assisting with transportation, power conversion, and all the other aspects of an international yacht sale contact us today!